Super Hero Boy: Finally, a way to get those nasty bottles clean! Finally, a way to get those nasty bottles clean! All of the moms out there or anyone who has had to clean bottles has experienced bottle funk at one time or another. Those blasted bottles just never seem to get clean, no matter how much you scrub, soak, and run them through the dishwasher. The worst part is when you've washed them, run them through the dishwasher, and then washed them again and though they LOOK clean they still smell like old socks. Finally there is a product that is made to solve just that problem! Dapple is the first dish washing detergent formulated just for stinky icky baby messes, and the coolest part is its all natural! You know I was actually pretty skeptical about how Dapple would work. Though I have been using all natural dish washing detergents for some time, I've rarely found anything that really gets my bottles and sippy cups clean, past either boiling them and reboiling them, or using the dreaded bleach method which has always made me incredibly nervous. I have done it in the past, but only in severely icky, smelly, or mold circumstances. Dapple on the other hand has been my new knight in shining armor when it comes to bottle and sippy cup odors. I almost hate to admit this to you guys, but I am the ultimate in lazy mommies! I do not like to boil our bottles or sippies as it just takes too much time. What little free time I have I don't really enjoy spending standing over a boiling pot of bottles. heh. Dapple seems to do as good of a job as boiling the bottles and all I have to do is wash my baby items the same way I always would, in the dishwasher. Dapple is pretty neato as not only is it made with natural enzymes, yes I know I mentioned that earlier, but it's designed specifically to attack the common proteins in baby foods. Especially the milk proteins, the usual culprit in those icky odors. Dapple comes in a dish washing detergent powder and a dish soap great for those who still use that medieval form of washing, ie hand washing. heh. Ok, I'm not that lazy as I do actually hand wash stuff too. The only drawback to Dapple is, unless your lucky enough to live close to one of the stores that stocks it, you normally have to order it online to get some for yourself. Though truthfully its nice not to have to drive to the grocery store anyways, as honestly I try to avoid driving anywhere I don't have to with the cost of gas lately! You can buy Dapple directly from their website or use the store locater to find a store near you. Diapers.com carries Dapple as well! I have two Dapple gift packs to give away to two lucky winners! Included will be one bottle of the dish washing liquid and a box of the dish washing detergent! Leave a comment on this post. Check out Dapple and tell me what is the most exciting thing to you about their cleaning products! "Mom-tested, pediatrician-approved" per their site. This is great as it is nice to know the doctors approve it but even bettery to know other Moms approve of it.. I love how the products seem to work despite using harsh chemicals. Thanks for the chance to try these products. They look awesome. the most exciting thing is the name. it leaves a lot of room for rhymes/slogans. The fact that it can get out that milky smell naturally is all I needed to hear. the most exciting thing about dapple products is that they are all natural. I like that they are natural. I like that the products are biodegradable! Yeah for the environment. This is the easy one, but it truly is the most exciting one! I am hoping to get this for my friends shower! thanks for introducing me to Dapple! I love how it has natural ingredients in it!!! I would love to try some "green" cleaners. I'm still using my old ones and I feel soooo guilty. It's exciting that it has natural enzymes. I've found that works best with stubborn laundry problems, so I'd like to try it in dishwashing products. Thanks for the chance to win. Full line of natural-based, baby-safe cleaners! I like the natural ingredients that is good for baby. 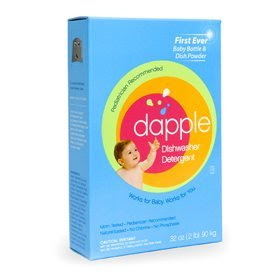 I like that the products from Dapple are made with natural ingredients and made specifically for babies. Thee's not many if any products that can say that. I would love to try Dapple for my newborn's bottles. Thanks so much for a great giveaway! I love that Dapple is natural and biodegradable! they donate to charities. i love that!!! I love it is all natural ingredients! I like that everything is natural and baby-safe! I like that they don't use harsh chemicals and that they are coming out with a toy cleaner! It gets the stinky milk smell out. I like that the Dapple products are low foam, rinse easily, and are natural-based and biodegradable. I like the odor removal. We have a similar problem with our Kleen Kanteens when we use them for anything other than water. I love that it's safe for my toddler! Very cool. I love the fact they are geared towards babies and they are all natural. You can't beat that! I love that they're products aren't going to introduce anything to my water table that is scary. We're on a well, so we have to be careful, it's not "out of sight, out of mind" like some water systems. These look great! All natural! We need more of a selection of natural products! I like all natural products since I have a lot of allergies. Most importantly safe for babies, and it uses no harsh chemicals. I like that they are natural based cleaners. Great giveaway, thanks! I'm most excited that this is made with natural enzymes. To me, the more natural a product is the better!! Special detergent for baby bottles is ingenius!! I love that they are going to be bringing out a toy cleaner - having something safe and effective would be awesome. I would love to give this a try. I'm intrigued the most by that fact that it's all natural. And also that they claim it works so well. I want to try! All three of these things are very exciting to me...this product sounds great!! I love the fact that this is a natural-based cleaning product. I can feel safer when I wash my kids items that will go in their mouths. Thanks for the chance to win! I like that it's made from natural enzymes. And it's a big plus that it will clean baby bottles. My cousin is having her third baby in October! It would be a great gift for her! I love that it is a natural based cleaning product and that it rinses fast! She would feel much better about cleaning the bottles for the new baby with this! gets rid of milk residue and odor! That is natural and actually works! What isn't there to love? Safe, mother approved, and gets all that nastyness out. We had so many issues with bottles and sippies getting all nasty but this seems like the answer to our prayers. Need to get some of this stuff. my favorite things about dapple is that it rinses easily. Gosh, I love that Dapple has natural ingredients. That they give a portion of their profits to children-oriented charities. I also love the logo design. THey are special formulated to address cleaning needs unique to a baby. I love how everything is biodegradable and natural. It's safe so I can use it around my kids. I love that it's safe for the baby! It's all-natural and chemical free! I like that they have natural ingredients. I like that they don't have a lot of chemicals! never heard of this but sounds like it is worth a try. I love that it is all natural! I love the fact that its completely safe and natural for my grandbabies. My daughter could really use this. Thank you! well i like that they don't use the harsh chemicals but am not a believer that they will clean those icky sippy cups. I hand wash, not by choice and I'll tell you trying to get the bottom of those cups after a little juice film ends up in there is no easy task.